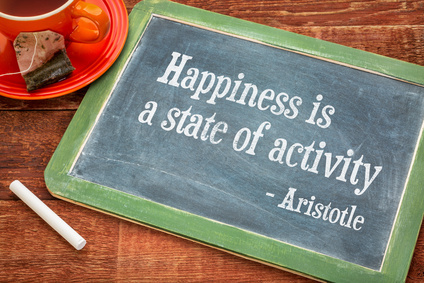 Today’s Monday Motivation: Happiness is a state of activity by Aristotle reminds us that you can’t wait around for happiness to come find you; you must be active in the search for happiness. You need to make choices, set goals, and plan an attack for achieving those goals. It seems that so many people these days are unhappy. Turn on the news and see a world of negative images. Article after article is being published about ways to find happiness. There is a self-help section in the bookstore that has dozens of books related to finding happiness. Finding is the key word here. It doesn’t come knocking on your door. It doesn’t leave you present on the doorstep. And it doesn’t come in the mail. You have the power to determine what makes you happy and what you have to do to achieve that happiness. Happiness has to be a state of activity because you must plan for it. So what makes you happy? And how are you going to achieve it?